More garden spaces are needed in Lincoln to address all of the people who want to grow their own food. Community Crops is always looking for new garden locations that can be developed in partnership with the community. We also need committed volunteers to manage the garden locations. Together we can create bountiful plots of land that feed families and connect people. After reading the information below, please contact Barb at barb@communitycrops.org or 402-474-9802 to talk about partnerships. What makes for a good garden site? Size is relative. One of our gardens is 1/4 of a city block. Another is a small house lot. Ideally, a location would be at least 50′ x 100′ or larger. The space should receive direct sun for at least 8 hours each day, preferably between 9am and 5pm. The easiest and cheapest is to get water from an existing source. Is there a nearby building? How about a house? At some sites we use the water from a private home and pay their water bill during the summer (about $400/season). If there is no convenient water source, installing a frost-proof hydrant can cost thousands of dollars. Rain barrels can supplement, but it is hard to store enough water for hot summer days. A small group needs to be dedicated to the project to see it through. This group will be the main point of contact for the gardeners, and will need to spend time at the garden every week to be sure things are functioning smoothly. They may also have other responsibilities such as tending flower beds, mowing grass around the garden, working with Crops to set up seating areas or fences, or organizing social activities in the garden. Gardening experience is helpful but not essential; what’s more important is the willingness to organize people to make things happen. During the spring, it may take 5-8 hours per week to get the garden going. Throughout the summer, expect to spend 2-3 hours a week at the garden. Crops can help find occasional volunteers to help with bigger tasks in spring or fall. Try to get at least a three year commitment to use the land for a garden, even if it is just a verbal agreement. Three years make the investment of effort into the garden worthwhile. Do you want to put up a fence or raised beds? Would you like to create a sitting area? All of these infrastructure items take some cash. Do you have people willing to pay for them? Crops can also suggest ways of getting funds. The best time to start a community garden is in the fall. Till the area and cover it with lawn clippings and leaves for the winter. Or just cover it with cardboard and then mulch. Your soil will be ready for planting in the spring with a lot less work. Start small. You don’t have to till the entire garden area the first year, you can always add garden plots in later years. Seating areas, fences, compost bins and other amenities can also be added later. Crops can be a central clearinghouse for materials and garden plot registration. We can help you get the basics–hoes, rakes, shovels, hoses and small hand tools. We can provide a lot of the seeds and plants that gardeners will need. We can also help you access things like mulch or manure as needed. Crops can add your garden to the list of locations and coordinate signing up for plots. We’ll keep all the contact information for gardeners and help with interpretation for non-English speakers. 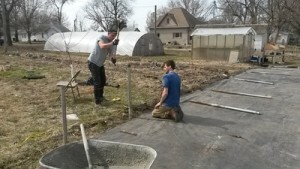 Over the past 12 years, Crops has helped start many community gardens. We can work with you on choosing a good location, assessing the soil, and working with volunteers. We can also help you learn about organic gardening principles. Crops has an ever-expanding list of volunteers that we can contact to help you with projects at your garden.